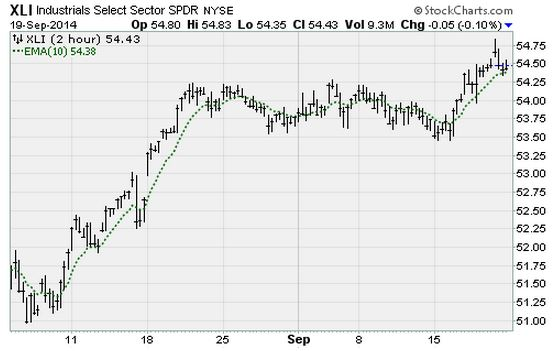 We just completed a successful trade in SPDR Industrials October $54 calls. XLI is an exchange traded fund comprised of all the industrial companies in the S&P 500. Top holdings include General Electric (GE), 3M (MMM), Union Pacific (UNP), Boeing (HON), Honeywell (HON) and Caterpillar (CAT). The fund had flattened out for the two weeks prior to purchase, reducing the implied volatility in the options, making them cheap. With sentiment neutral and the fund likely to shake off its funk and trend higher, it looked like a good time to enter and we bought at 81 cents. Shares of XLI jumped more than 1% at the start of the Sept. 19 session, pushing the calls right through our target at $1.07. That yielded a quick 31% profit, which was great for a few days' hold.